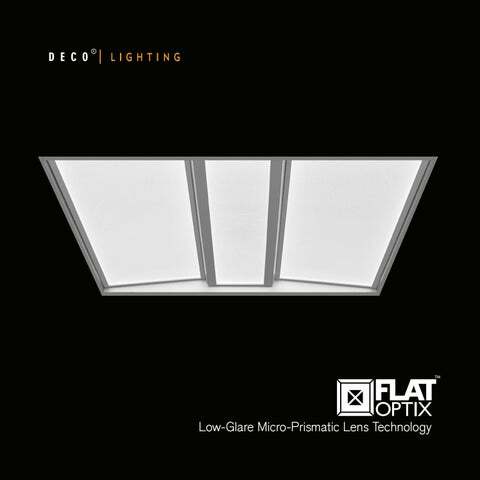 Welcome to The Flat Optix™ micro-prismatic lens is designed to the European EN12464 glare standard for office and task lighting. Providing uniform, well-balanced illumination, Flat Optix™ also delivers unmatched energy savings by only illuminating key task areas. Promoting well-being and contributing to highproductivity, Flat Optix™ is at the forefront of practical and well-designed glare control solutions being introduced to the lighting industry. Next-Generation Luminaires Designed to deliver an unprecedented blend of form and functionality, Flat Optix™ luminaires pair a sleek and modern aesthetic with thoughtfully-crafted features that provide comfortable illumination to interior spaces. The unique Flat Optix™ micro-prismatic lens illuminates key task areas while directing light away from occupants’ eyes, enabling luminaires to provide high efficacy illumination without creating uncomfortable glare. Featured in this image is the Skyler™, the industry’s first edge lit volumetric luminaire. Skyler™ provides glare free lighting without the caving effect of deep cell parabolic luminaires, and is ideal for tight plenum areas, such as beneath duct work or structural beams. •	Light is redirected from 60° to 90° degrees of luminaire, UGR <19 •	Conical structures built into the lens minimize high angle glare •	Allows for increased efficacy, rather than lumen output glaring at occupants •	High efficiency and energy saving •	Protection class: IP44 Damp Location Rated •	Increased productivity, decreased eye strain. •	Harsh glare at viewing angles above 60°, UGR >24 •	Wide beam angle at 180° •	Uncomfortable glare •	Reduction in visibility caused by intense light source in field of view •	Protection class: IP22 protects only from objects greater than 12 millimeters •	Loss of productivity, increased eye strain. = Volumetric flat panel with micro-prismatic lens will reduce glare going into the occupant’s eyes. = High glare flat panel makes occupant’s eyes feel uncomfortable. Deep cell parabolic louvered troffers create scattered hot spots and lead to a “caving effect”, meaning ceilings and upper portions of the walls are dark. While edge lit flat panels more effectively illuminate the walls and ceiling, the 20 percent glare negates any benefits. Skyler with Flat Optix™ focuses lumens on task lighting and has about 6 percent of the delivered light in the 60 to 90 degree zone, effectively illuminating the ceiling and walls, while maintaining a UGR<19. Smart Control Deco luminaires using Flat Optix™ allow a myriad of driver and control choices. Deco Lighting is in partnership with the companies below, and not only integrate their sensor and driver technologies into Deco Lighting luminaires, but also fully test the sensor/driver combinations before providing the systems to consumers. Deco Lighting works closely with the companies listed below to ensure that their drivers and sensors are being used effectively and to their full potential. When a consumer buys a car, they expect the manufacturer to fully understand and warrant the car’s components. This should also be the case for lighting and lighting controls, where consumers can rely on Deco Lighting to be the go-to experts for the technologies embedded into Deco Lighting Luminaires. 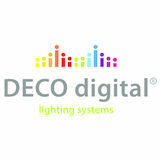 Below is an abbreviated list of Deco Lighting’s driver and sensor technology partners. Please contact us if you have any specific questions about a technology, and we will be happy to provide answers quickly. Patented, software-defined smart sensor solution that tracks real-time occupancy, light levels, ambient temperature and energy usage, along with other data points. Enlighted sensors can distinguish between people and objects, customize controls for specific tasks, leverage ambient light, and provide unmatched coverage for data collection. Utilizing the proprietary EcoSystem® communications protocol, Lutron provides a two-way digital network that incorporates motion sensing, daylight harvesting, occupancy/vacancy sensing, and high performance dimming functionality. Phillips sensor solutions are designed for applications that include retail, hospitality, office spaces, public areas, and education. Offering devices that combine motion detection, light level assessment, and dimming into single units, Phillips delivers a system for sophisticated yet simple lighting control. nLight® is a networked digital lighting control solution that delivers energy savings and increased user configurability by combining time-based, daylight-based, sensor-based and manual lighting control schemes. Deco Lighting’s industry-leading 10-Year, 100,000-hour warranty evolved from our team’s drive to design, engineer, and manufacture top-quality LED lighting systems in the United States. From the initial sourcing of resilient fixture materials and high-performance LED chipsets to the attention to detail we provide during assembly and packaging, this complete start-to-finish assurance process is what gives us the confidence to back all of our LED luminaires with this unbeatable warranty. LED State-of-the-art LED chipsets deliver unparalleled lighting performance and give Deco Lighting fixtures an L70 rating of 100,000+ hours. This translates to an operational lifetime of over 15 years if operated at a full 24 hours per day! Labor Included In addition to covering the entire fixture, including the LED driver, our warranty includes a labor allowance should any issue arise within the DECO warranty period that requires labor to be performed during the correction or replacement process. Cooltech By under-driving our LEDs we reduce fixture temperature and extend LED life considerably. In fact, our patented Cooltech boards lead to a faster heat transfer rate and lowers heat buildup (up to a 20° C reduction) compared to the traditional LED board systems used by our competitors. These six key elements, combined with our dedication to constantly innovate and develop next-generation lighting solutions, come together to deliver a winning formula when selecting Deco products. In essence, we put our money where our mouth is and provide our clients the confidence to specify our innovative lighting systems across a variety of applications. Low-Profile Design Utilizing innovative edge-lit LED technology to reduce housing depth, the Skylerâ&#x201E;˘ Volumetric Flat Panel features a compact yet sturdy aluminum construction designed to blend into modern architectural spaces. The bold, striking design of the Skylerâ&#x201E;˘ goes beyond what was previously possible with fluorescent technology or even traditional LED troffer luminaires. The Skyler™ recessed volumetric flat panel luminaire is an innovative LED fixture designed to deliver a modern aesthetic and complement today’s interior spaces. Featuring a lowprofile form factor, the Skyler™ is ideal for buildings with a low plenum space and is suitable for all standard 2x2 or 2x4 grid ceilings. Incorporating edge-lit LED technology and micro-prismatic conical structures in the diffuser lens, the Skyler™ features a Unified Glare Rating (UGR) of less than 19, delivering light where it is needed and reducing direct glare to occupants. This creates a soft and comfortable lighting experience for commercial and institutional spaces including open offices, classrooms, retail and healthcare facilities. Low-Profile Design The Circa™ Round Flat Panel features an incredibly slim housing depth of only 1 inch and incorporates the next-generation Flat Optix™ lens to eliminate glare commonly associated with high efficacy, edge-lit technology. The slim profile of the Circa™, along with a diameter of up to 36 inches, delivers a unique and minimalist aesthetic to interior spaces. The Circa™ is a unique round flat panel luminaire designed to provide smooth, dispersed illumination for modern interior spaces. Featuring a low-profile aluminum construction, the Circa™ can be hung from ceilings of any height. The Circa™ incorporates innovative Flat Optix™ that are engineered to eliminate glare issues that have become increasingly prevalent among LED luminaires as efficacy has increased over time. Constructed with high efficacy LED chipsets and an edge-lit design, the Circa™ delivers well-balanced light output with a Flat Optix™ lens and is ideal for specifications across a variety of commercial and institutional spaces including open offices, classrooms, themed areas, retail spaces and healthcare facilities. Low-Profile Design The FlatZoneâ&#x201E;˘ series features a sleek and sturdy die-cast construction with an incredibly low-profile housing that fits into any low-plenum condition. This combines a contemporary look with next-generation LED performance all packaged into a slim fixture thatâ&#x20AC;&#x2122;s less than a half-inch deep. Seamless Presentation The FlatZoneâ&#x201E;˘ luminaire is available in 4â&#x20AC;? and 6â&#x20AC;? widths, delivering modern lighting performance while matching the desired aesthetic of any interior space. The edge-lit LED technology provides smooth, well-dispersed illumination that provides the luminaire with a minimalist presence that meshes discreetly into a space. 4” and 6” Technical Channel Luminaires for T-bar ceilings. The Flat Zone™ Series from Deco Lighting is a family of lowprofile, edge-lit flat panel LED luminaires compatible with a variety of integrated ceiling systems, such as TechZone from Armstrong® Ceiling Solutions and Logix™ by USG. The FlatZone™ is offered in 4” and 6” luminaire widths, providing a choice of aesthetic without sacrificing performance or lumen package options. 2917 Vail Ave.Commerce, CA 90040 T: 800- 613-3326 â&#x20AC;˘ 310-366-6866 F: 310 -366-6855 info@getdeco.com www.getdeco.com ÂŠ Copyright 2018 Deco Enterprises, Inc. All rights reserved.